The Pentagon announced it has deployed two Predator drones to Latvia for the first time to reassure European allies. 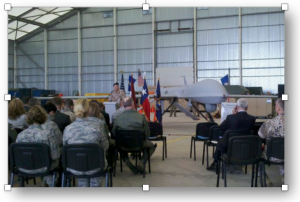 The two intelligence-gathering drones were deployed along with 70 airmen to Lielvarde Air Base in Latvia over the weekend to participate in partner training, said Navy Captain Jeff Davis, a Pentagon spokesman. “This temporary assignment of aircraft and personnel will test their ability to forward deploy (remotely piloted aircraft) to conduct air operations and assure our Latvian allies, NATO allies and European partners of our commitment to regional security and safety,” said Davis at a daily news briefing. As part of the European Reassurance Initiative, the U.S. deployment, which would last till mid-September, was meant to support its North Atlantic Treaty Organization (NATO) allies against what the Pentagon describes as a rising Russian threat in the region. Meanwhile, four U.S. Air Force F-22 Raptors arrived in Germany late last week. The Pentagon said on Aug. 24 that the military would gradually send F-22s to Europe for the first time as top American military officials began to openly label Russia as the greatest threat to the United States.